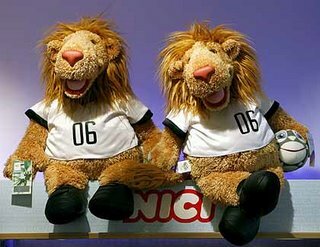 "A German stuffed toy manufacturer that has exclusive rights to produce the official World Cup mascot -- Goleo VI, a shaggy-maned lion in a football shirt -- has filed for insolvency because no one wants to buy it." Why is this funny? And why aren't the soccer-lions wearing shorts? And why is only one of them bashful about it? And is this the most useless blog post ever?